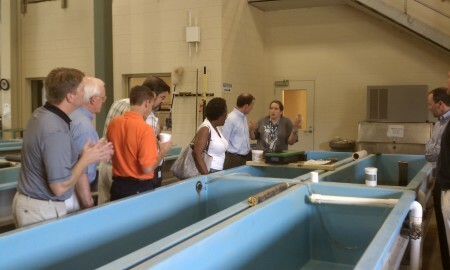 Auburn Rotary Club took an industry visit to the Auburn University Fisheries unit on North College Street on July 24, 2013. The group was introduced to the research and experiment stations that house a number of ongoing experiments by students and faculty. They were able to learn about the fish market and upcoming plans for that facility. Rotarians also were able to tour the new aquatics learning center that should be opening soon to the public.